Whenever I see Ellen Datlow’s name as editor on the cover of an anthology, I know I’m in good hands. Datlow has a made a thirty-plus year career of choosing good stories and developing collections that take different aims at the theme. 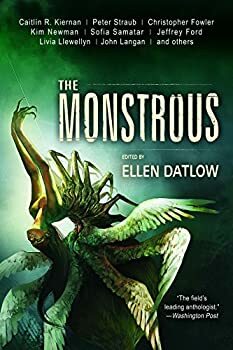 The theme of The Monstrous is monsters, and Datlow makes sure to explore all facets of that word with this mostly-reprint anthology from Tachyon Press. There are twenty stories in the book. One is original to the anthology. The reprints include one classic horror story and a few that read as dated to me. Datlow’s standards of excellent writing and good characterization stand throughout the book. I’m going to discuss two pieces out of sequence, because they left me puzzling. The Monstrous includes “Down Among the Dead Men” by Jack Dann and Gardner Dozios, which was first published in 1982 in Oui Magazine. In a German concentration camp during WWII, Bruckman discovers the secret of Wernecke, one of the other prisoners. Wernecke is the one who keeps up the spirits and morale of the other prisoners, but at a price — a horrific one. When Bruckman discovers his secret, the story opens up moral questions that still aren’t easy to answer. For a while, Bruckman’s relationship with Wernecke mirrors that of Nazi collaborators. Is it ever right to make a deal with a monster? Is it acceptable to sacrifice the few — the weak — for the many? The language of the story is straightforward and unadorned, fitting its setting. Perhaps the most chilling thing in this story, still, is that there are worse things in a Nazi concentration camp than a monster. The Monstrous also has a story called “Ashputtle” by Peter Straub. This story first appeared in Datlow’s and Windling’s 1992 anthology Black Thorn, White Rose. As you guessed from the title, that book featured dark retellings of fairy tales, and Straub’s piece tells a toxic version of Cinderella. Mrs Ash was not rescued by a handsome prince. She teaches kindergarten and is sometimes driven to do frightening and terrible things. Ash is a first-person narrator and Straub’s control of this prose, his consistency of tone and his eerie imagery are the strengths of the piece. His own contempt for this character shows through though, and he makes Ash a grotesque rather than a real character. I could not like this story. The shocking behaviors didn’t seem so shocking, just sad. Reading this and later reading “Down Among the Dead Men” I began to wonder what makes one story dated and the other a classic. I think it’s something to do with the willingness to embrace the character rather than stay at a safely mocking arm’s-length. Many horror stories, especially short ones, rely on a twist ending. As readers grow more savvy, writers even employ double- and-triple-twists. The double twist in “A Natural History of Autumn,” by Jeffrey Ford, is perfectly executed and he sticks the dismount as well. This quiet, atmospheric story about a Japanese couple planning a visit to a hot springs draws on Japanese folklore to give it terror, and the elegant prose is an added treat. Dale Bailey’s “Giants in the Earth” makes us question just who is the monster, as miners uncover a sleeping giant. The creature asleep in the earth is decidedly not a monster, but as the mining team decides what to do, the monstrous aspects of human nature poke out their fanged snouts. In “The Beginning of a Year Without Summer,” Caitlin R. Kiernan provides a brooding, hallucinogenic story that runs on two tracks. The narrator, a paleontologist who teaches at a local college, has a conversation with a young woman about a murdered swan on the shores of the local lake. He also visits a strange club and has a disturbing conversation with a man there, while a young woman dressed only in feathers dances. Kiernan uses the metaphor of a flipping coin to structure the story (although the dancer and the swan are linked images), but close to the end a third track appears, about a train caboose and the corpses of ravens. The story is elegant, controlled and disturbing. It filled me with a sense of dread and foreboding. It’s not what has happened that’s frightening… it’s what’s going to happen. “A Wish From a Bone,” by Gemma Files, is an action-horror story that would be great as an episode of Tales From the Crypt if they shelled out the bucks for good production values. A low-budget TV show (think Ghosthunters or Destination Truth) explores an ancient temple in the middle of a war-torn desert. Deep in the temple, they discover a dry well surrounded by a mosaic. The mosaic includes seven strange figures. Then, one by one, the cast and crew begin to change. Only one, a substitute camera operator, seems to know what’s going on, and it’s not a coincidence that her name is Camberwell. The metamorphoses of the crew are creepy and the action moves at a good clip. This is less dread-filled horror and more action-adventure. Livia Llewellyn successfully mixes Lovecraftian world-building, teen-aged-girl journaling, and family vacations into a cocktail of terror in “The Last, Clean, Bright Summer.” Hailie’s family packed up their Tacoma, WA house and is heading to the coast for a “humongous” family reunion. At first it seems merely like an excessive vacation, but as they reach the coast and head for Oceanside, Hailie records bits of strangeness in her journal. They are not strange to her, just to us. The family trip seems normal, even fun in spots, with a rising tension underneath the travelogue. Hints emerge that South America is gone, for instance, because people there didn’t do something correctly. Hailie mentions seeing The Watchers (she waves to them). As with a real journal, days and sometimes weeks go by before Hailie gets back to it. This plausible structure lets Llewellyn change the tone, dramatically, after the event the families have gathered for. Llewellyn’s shift in writing is flawless. I don’t know if I entirely believe, or even completely understand, the details of the horrible denouement, but I believe the horror, and in the terrible change Hailie has encountered. Adam-Troy Castro manages to deliver that rare beast, the horror-humor story, with “The Totals,” as we eavesdrop on the quarterly sales meeting of monsters. Castro leads us down the garden path in the first few paragraphs, then whips away the veil to reveal the reversal. Dark and fun. Kim Newman’s “The Chill Clutch of the Unseen” is a story in a subgenre a friend of mine calls “coming of old age.” It’s autumn, “kissing close to winter” Newman tells us, as retired Chief Stockton rests his bones near the stove in the train station, remembering the old days. The train station is no coincidence, because when the monsters used to come to town, they came by train, and Stockton wasn’t just a chief of police, he was a monster-hunter. The Stocktons are protectors, even though it seems that the monsters have stopped coming. At the beginning, the story lingers over the station master’s daughter Irene, who now runs the station. She is less a character than a type; wearing her hair in braids like “a storybook child.” Later, see that this is to show us what Stockton must protect. Stockton learns that some fights are never finished, and some legacies must be passed on. The autumnal tone Newman uses suits this story perfectly. “Catching Flies” by Carole Johnstone is a conventional coming-of-age story, as our child narrator moves from innocence to knowledge and from childhood to heroism. The terrifying thing that happened in Joanne’s mother’s house is not over, and Joanne soon figures out that her baby brother is the next target. “Our Turn Too Will One Day Come” by Brian Hodge was one of the less successful stories for me. Usually when the main character gets a call from a family member to come home right now and bring a shovel, I’m hooked. I was intrigued, and Hodge excels at descriptions of the Colorado Rockies — the rugged spires, the deep gorges and the sheer cliffs. The narrator and his sister Noelle are of Scottish stock, and while he’s burying… something… for her, he thinks back about the family stories. This idea was interesting but didn’t remain compelling, and the how-to of the story didn’t seem possible. I also never completely accepted the parallels between the Highlands and Estes Park. Still, this is worth reading for a fine opening paragraph and the sharp, forbidding landscape. Stephen Graham Jones’s “Grindstone” is also set in the American West, this one during the 1880s. This weird west tale shimmers with eerie description. Derle is a criminal, just ahead of a posse, his body riddled with lead slugs as he makes his way toward a rock in the middle of the creek. It’s plain that Derle is more than mortal flesh and blood. At first it seems that the demonic power of the rock will save him, but nothing here is what we expect. Time moves forward, and Derle’s evil continues, just in a new form. The tone here, of a tale or a semi-official “report,” adds to the diabolical nature. “Doll’s Hands” is written with layers and layers of horror, as Adam L.G. Nevill gives us a surrealistic future of mutated humans. “I am the one with the big white head and the doll hands,” the narrator tells us. Doll Hands, along with Vinegar Irish and the White Ape, are preparing the Annual Banquet for the residents of the West Block of Gruit Huis. The story seamlessly interweaves fantastical imagery with the concrete detail of brick walls, trucks, and rooms with sloping cement floors and drains at the center. When Doll Hands tells us, “Follow me through the dark house. Watch me kill the old lady. It won’t take long,” the suspense stretches to the snapping point. Adam L.G. Nevill expertly manages the terror here. I don’t consider “How I Met the Ghoul” by Sofia Samatar, to be a story. I consider it a vignette, and I consider it to be excellent fun. In 2008, a reporter meets the ghoul at an airport restaurant for an interview. Samatar is in a class by herself when it comes to creating a narrative voice, and the reporter’s voice here is worldly, modern and honest. The ghoul is thoroughly modern too, in many ways (she orders the Hungry Highflyer Special and a Coke) but Samatar flashes us glinting, shape-shifting cameos of the ghoul from folkloric tradition. How does a conventional monster make the shift to modern times? The ghoul lets us know. There is no one writing like Samatar right now, and it’s always a delight to read her work. The ghoul is a friendly, elliptical enigma to the very end of this haunting piece. “Jenny Come to Play” by Terry Dowling was originally published in 1997, and this may explain some of my problems with the story; it may be a bit dated. At the exclusive Blackwater psychiatric institute, Dan Truswell must determine why voluntary resident Julie Haniver is so terrified of her sister Jackie. Julie admitted herself to hide from Jackie, who has now found her. As Dan interviews the two women, a creepy story emerges involving carnivals, side shows, and conjoined twins. It becomes harder and harder to tell who is lying, and the sisters’ backstory is genuinely disturbing. I wanted to like this, but a scene where Dan answers his phone during a therapy session shredded my suspension of disbelief. I have to say that I was intrigued by the mysterious patient Peter Rait. Glen Hirshberg retells a dark fairytale in “Miss Ill-Kept Runt.” Chloe is five. She and her older brother, the Miracle, and her parents are leaving their home and moving to Minnesota, driving in their old station wagon. Chloe and the Miracle are riding in very back, which Chloe calls the way-back. As the sun goes down and the sky gets darker, Chloe begins to think the people in the front seat are not her parents. The truth is far worse. Against the tiptoeing sense of wrongness, Hirshberg contrasts perfectly-chosen details; power poles whirling by the windows of the car, corn fields, Pokémon cards. These details enhance this terrifying story. A.C. Wise’s “Chasing Sunset” combines hard-boiled noir language with Lovecraftian weirdness, all in a headlong race against time. A young man whose bloodline is cursed — or gifted, depending on how you look at it — tries to outrun the dying patriarch, his father. His tools: a fast car, a bad attitude and a briefcase full of magic. As he drives, flashbacks show us just what he is running from. An exciting story with a nice twist, this one uses short sentences to up the urgency. A whiff of heartbreak follows “The Monster Makers” by Steve Rasnic Tem. An elderly man tries to care for his wife, who has succumbed to dementia, and control his grandchildren, who are literal monster-makers. Like “The Chill Clutch of the Unseen,” this is a story of legacies, in this case poisoned ones. The languages maintains a phantasmagorical quality throughout and ends in tragedy. This story was originally published in 2013, before the death of Melanie Tem, a celebrated writer herself, and Rasnic Tem’s wife. It may just be hindsight, but it was hard not to read more into this story of a man seeking a lost wife in a world of monsters. Christopher Fowler returns us to action-horror in “The Piano Man,” set in every American’s favorite weird city, New Orleans. Our main character, a travel writer for the Fresno Freedom Travel Guide (and I loved that!) finds a bar off Bourbon Street, encounters a beautiful and unusual piano, and falls into a story of love, jealousy and dark magic. The piano used to belong to Warena Samedi, a powerful priestess. The reporter brings a jaded, Northern skepticism to the tale of love and betrayal, but soon finds himself fighting for his life against a magical monster. What stood out for me in this story were the voices of the various old women he interviews as he tries to get the “real” story. Bottom line: don’t mess with priestesses. The final story in the book, “Corpsemouth” by John Langan, is original to this collection. An American makes a visit to his ancestral homeland in Scotland after the death of his father. Once there, he begins to be troubled by strange dreams and the memories of the odd shapes his father drew before he died. The story is long, taking us through family dinners and driving tours, but it all leads to the convergence of those shapes and an ancient story about Merlin, who raised a monster to fight a Scottish laird’s enemy. Some battles don’t end with death. “Corpsemouth” has an elegiac quality that lasts beyond the final plot twist and the final sentence. A fine, brooding story. There is something here for everyone and just about every monster. My feeling, that I can’t go wrong with Datlow, is validated again. Publication date: Octoberr 6, 2015. Take a terrifying journey with literary masters of suspense, including Peter Straub, Kim Newman, and Caitlín R. Kiernan, visiting a place where the other is somehow one of us. These electrifying tales redefine monsters from mere things that go bump in the night to inexplicable, deadly reflections of our day-to-day lives. Whether it’s a seemingly devoted teacher, an obsessive devotee of swans, or a diner full of evil creatures simply seeking oblivion, the monstrous is always there—and much closer than it appears. Great review! I agree with you about Datlow – one just can’t go wrong with one of her collections. And I’ve loved just about everything John Langan has written. I’m very much looking forward to reading this Datlow collection, especially after your review.